I think one of my main concerns as a teacher will be to make sure that my students are conscious of some of the dynamics of culture and power that we’ve been talking about over the past three weeks, and that they feel safe discussing them in class. I think one of the greatest opportunities of discussion-based classes is the ability to encourage students to ask critical questions about the messages they are receiving from the world around them. As a language arts teacher, I hope that my students will be able to make their own judgments about the dynamics of culture and power in the works we read for my class. 2. I chose three words from the word wall that I’m still working on or trying to figure out. Place-Based Education: This is something that I believe very strongly in, and I’ve tried to give my students place-based projects in the past, but I’ve always found it a little bit difficult because I move around a lot and I’m rarely in a place that I know a lot about. My cousin Sally, who also teaches in Fairbanks, and who grew up there, is brilliant at coming up with place-based projects. In her first week as a TA, she took her class on a field trip to the reuse section of the dump, and that’s now a standard field trip for composition classes, because it turns out you can learn a lot about Fairbanks by careful observation of the dump’s reuse pavilion. My favorite lesson of Sally’s is on citations – students can plan a trip anywhere in Alaska, using an unlimited imaginary budget, but they need to research it thoroughly, write it up, and cite everything. I’ve stolen many of Sally’s assignments, but I’ve never quite been able to imitate her creative flair for place-based education. This class has given me a good sense of the variety of place-based projects that are possible, though, and I hope I’ll eventually be able to stop stealing assignments from Sally. Safe Space: This is a tricky one for me, and the reason why it’s tricky came up during our class discussion about David Katzeek and trans issues. That discussion highlighted a complicated question: how do you balance different kinds of safety? How do you make sure a space is safe for every marginalized group, for instance trans students, while also making sure it is safe for open and thoughtful discussion? If an authority figure makes a remark, as David Katzeek did, that comes across as transphobic, how does the teacher deal with that so as to keep the space of the classroom as safe as possible for as many people as possible? This is something I’m still trying to figure out. Eurocentrism: I chose this word because the reality is that my own tastes in literature are pretty Eurocentric. I was raised in a family that reads a lot of Victorian novels and turn-of-the-century children’s literature, and that’s still a big part of what I read for fun. Since I started teaching, I’ve made an effort to make my reading more multicultural, but I know I still have a long way to go. 3. My plan for the year – well, it’s hard to say, because my conversations with my host teacher have been quite brief so far, so I don’t know how thoroughly she has the year planned out. In the future, I will certainly aim for a lot of diversity in the authors and the readings I assign my students. I think it’s important to represent writers of many different cultures, and to make it clear that they are on the reading list because they are good writers that the students can learn from. I also hope to assign my students a lot of writing by Alaskan writers – Alaska Native writers, whenever possible. I’ll be at Mt. Edgecumbe, working with students from all over Alaska, so one challenge – assuming I get any say in the reading material – will be finding enough material from different parts of Alaska that all of my students feel represented. I will also, hopefully, be able to use oral histories from all over Alaska, which will allow my students to do some place-based investigation of an area they are from or have a connection to. What did the teacher in me learn? Last semester, I had to teach a class on a subject I didn’t know much about. My class got switched at the last minute, and I ended up taking on a business writing class that I didn’t feel at all prepared to teach. As I always do when I get thrown a class at the last minute, I asked everyone I could think of for ideas, and my coworkers ended up steering me toward a mostly project-based approach as the best way to handle the situation. My students started by doing individual presentations and then put together two group presentations, with the last one functioning as the final. As far as I could tell, the class went well; we had a fun class dynamic, and the groups all seemed to get along and share work reasonably equally. This class was an interesting chance to see project-based learning from the other side – to be a member of one of the groups. Having done the project, I have more mixed feelings about project-based learning than I had before. I think it’s a great way to motivate students – I know I went into high gear as soon as I heard the word “publish,” and I think my group as a whole produced a much higher level and volume of work than we would have without that word. 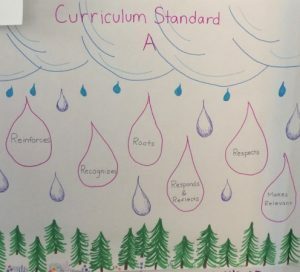 What I realized, though, is that an entirely project-based approach makes it difficult for the teacher to control the overall vibe of the class. I was very lucky, last semester, to have a class where we all got along well and there were no complicated group dynamics (that I knew of, at least). Here, I think we all had the best intentions, but there were still clashes, and that makes me wary of making a single group project the central focus of a class. 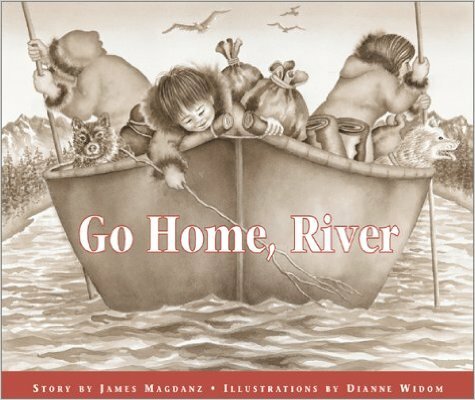 I chose the picture book Go Home, River, by James Magdanz and Dianne Widom. This book is set in the late 1800s, and follows an Inupiaq father and son on a journey along the Kobuk river to a trade fair on the coast. Along the way, the young boy learns about the cycle of the river: flowing from the mountains to the sea, then returning as fog and rain to the mountains to begin the cycle again. The narrative of the book follows the flow of the river, and when it is time for the father and son to go home to the mountains, the father explains that the river is going home as well. My group discussed “White Privilege: Unpacking the Invisible Knapsack” by Peggy McIntosh. We were all white, as it happened, and I found it interesting that within our group there were different levels of familiarity with the concept of white privilege. In Peggy McIntosh’s article, she talks about how difficult white privilege is to see and engage with, if you happen to be white. Unless you pin it down, as she does by listing every aspect of her privilege, you’re apt to forget all about it. And you want to forget it, she argues, because it’s not a comfortable thing to think about; it throws everything about your own identity and accomplishments into question. Now, decades later, white privilege has become such a buzzword in academic and political circles that it’s easy to assume that we know what it means. I wonder, though, if we really do, or if we fool ourselves into thinking we’re fully aware of our privilege when all we’ve learned is how to use the word. What our group discussion taught me was that it’s still an uncomfortable, awkward thing to read McIntosh’s list and confront those privileges directly. Our group spent a lot of time on the question of dominance and guilt; if privilege was just a system for pushing one group up and another down, then what were we expected to do – what could we do – to even the balance? I think the most important thing we can do is foster discussions between our students about white privilege. It’s common for people to push back at being told that they have white privilege. They often see the concept of white privilege as a way to place blame on them for something they have no control over. And sometimes it is even presented in that way, as an accusation leveled at an individual. I think it’s important to teach students that while white privilege does exist, it’s not a matter for individual blame or individual guilt. I think it’s important to give students plenty of chances to discuss the issue of white privilege in a diverse environment, so that they learn how to address it with nuance and understanding. There was one more thing that I thought about, which is how rare it is for white people to find themselves in a situation in which their white privilege doesn’t work. It happened to me once, when I lived in the Republic of the Marshall Islands and was bullied for being the only white kid in my second-grade class. Although in theory I still had white privilege – I was rich by Marshallese standards, I would be going back to America eventually – I had no way to access that privilege. It was a currency that didn’t work in the country I was in. It was a tremendously disorienting experience, and I’ve never felt so powerless. And it made me realize how right McIntosh is about the invisibility of white privilege – for I never realized I had been living life with a safety net until that safety net suddenly wasn’t there. Most of the children’s toys had some kind of practical connection to adult life. 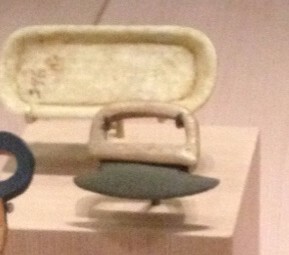 There was a tiny, sled, an equally tiny canoe, a toy bowl and spoon, a miniature harpoon and a miniature ulu. But there was also a row of carved ivory birds that the display described as game pieces, and carved ivory story knife with tiny ivory figures balanced on its edge. I was struck by the smallness of all the toys. The miniature tools weren’t fitted to a child’s hand; they were smaller than that. They looked like practical things, and yet they were clearly designed to be toys and nothing else. I was impressed that in a civilization where resources are scarce, where no one can afford waste, people were willing to spend time and care and materials making tiny works of art for their children to play with. I took photos of all the toys in the exhibit, but I chose the ulu for my featured image because something about its simplicity appealed to me right away. The blade is slate, and the handle is bone.